June 5, 2013 0 comments on "Homemade Sloppy Joe Mix Recipe"
Sloppy joe seasoning mix is really easy to make. You probably already have in your pantry most of the herbs and spices you need to make it. Why buy the store bought kind when you can make it yourself in just a couple of minutes? When I was looking around for sloppy joe seasoning mix recipes, I ran across this recipe. I decided to give it a try. These measurements make one batch of sloppy joe seasoning. You can easily double or triple the amounts to make more. Store in an airtight container. I am using a canning jar to store mine. You can also find really convenient small glass storage jars on Amazon to store your mixes and spices in. To make the sloppy joes, brown a pound of lean ground beef. Drain fat. Add 1 cup ketchup, 1 tbsp. Worcestershire sauce, 1/2 cup water, and seasoning mix. If you prepared a large batch of seasoning mix, then you will want to use 1/3 cup of seasoning. Add more ketchup or some water, until it reaches the desired consistency. Simmer for about 10 minutes. I tested this recipe out on my family, and it was a big hit. Even my picky boys liked it! Like this recipe? 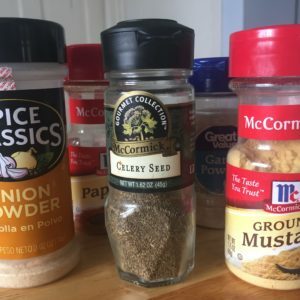 Try this recipe for easy homemade taco seasoning mix.